Anya is a teenage girl of Russian decent and lives alone with her mother and brother. She has lost her accent by spending years in ESL classes, and yet she does not fit in in school and has typical issues at home. Feeling fat and ugly, she goes by her days in school feeling unseen and unheard. She skips classes or fakes injuries in PE. But she isn’t really alone. There is one more boy in school who is also Russian. He is small, very intelligent and exactly the kind of kid that gets’ beat up by classmates and picked on. Yet, Anya cannot overcome her own numbness to school and social life to reach out to him. 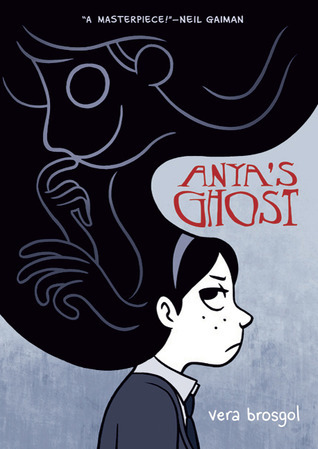 During an accident, Anya stumbles upon a skeleton with its ghost attached and the ghost follows her home. From here, the two of them seem to grow a bond that benefits both of them in ways to make them stronger and Anya more popular in school. However, Anya finds out the secret truth about her ghost friend and ends up relying on the help of the Russian boys’ intelligence to uncover its death. Can she manage to do so before her own family gets haunted by this ghost? This graphic novel touches on all the issues of insecurity in school and fitting in with peers. There are the popular kids and those who want to be. As usual, it is not what it seems to be, once you realize the grass is not greener on the other side. Entertaining, clean graphic novel. I enjoyed the ghost idea and for a few moments it had me up in my seat, thinking this ghost is going to go rogue on the family!